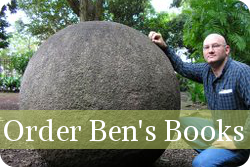 In the current issue of Skeptical Inquirer magazine I have a column about investigating claims of egg balancing in the Ecuadorean jungle at the equator! Check it out on finer newsstands now! You can find more on me and my work with a search for "Benjamin Radford" (not "Ben Radford") on Vimeo.